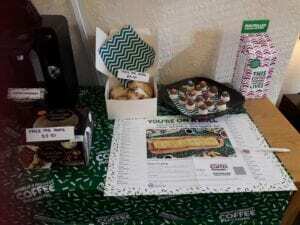 41 South Bar's Macmillan Coffee Morning a Success! 41 South Bar’s Macmillan Coffee Morning a Success! The dental team here at 41 South Bar would like to say a huge thank you to all of those who came to support their Macmillan Coffee Mornings over August and September! We were so pleased to see so many faces coming together and supporting a fantastic cause, with many stunning and scrumptious cakes, bakes and cups of tea and coffee on offer. In total, we raised a fantastic £290.00 for the charity – which will help towards specialist nurse training and care for individuals who have been diagnosed with the terrible disease, cancer. We hope that our dental patients visiting for their specialist dental treatments enjoyed their welcoming sight of delicious treats, as well as family and friends of the practice. We will be hosting many more coffee mornings in the future, and we hope you can join in, too! We will keep you updated on our Facebook page for when the next event will be and we can’t wait to better our total amount of money raised! If you would like more information on dental treatment offers or prices for Invisalign, dental implants or general dentistry, please contact our team today who will be happy to book an appointment for you.